This weekend we had a birthday party for the Bettdeckererschnappender weisle. In between the singing, eating copious amounts of excellent food, huddling around the Chiminea for warmth and watching the kids performance pieces, I set up the scope and briefly showed people the Moon before the clouds came over. 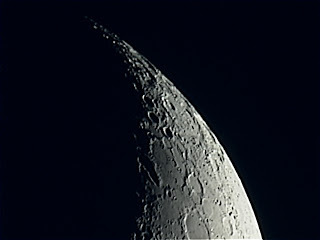 Here's an nice part of the Moon, imaged using the Canon IXUS and my digital camera holder on the 4" reflector. 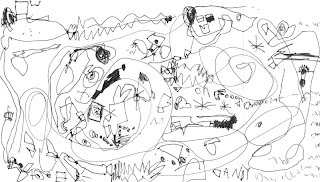 MiddleOne drew this rather active scene. The aliens look happy. 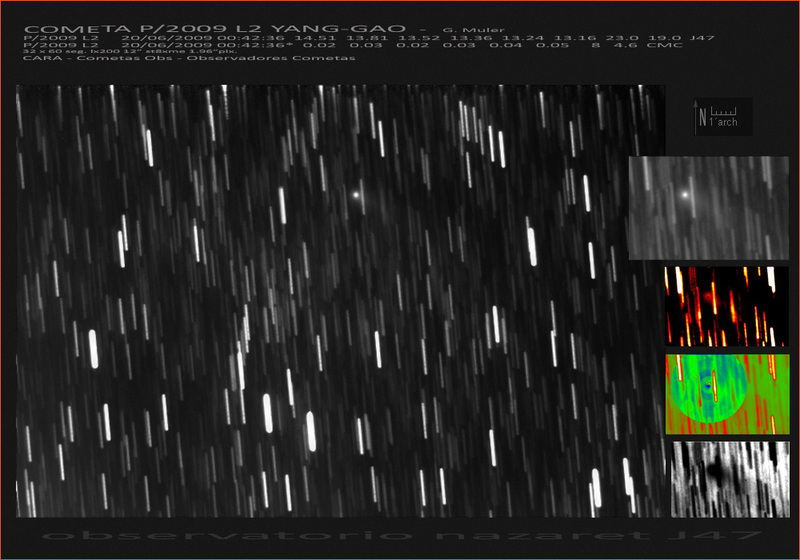 People have been getting some nice images of the recently discovered comet P/2009 L2 (Yang Gao). Nice images from Martin Mobberley here, Erik Bryssinck here, Alfons Diepvens here, and Gustavo Muler has a lovely image and animation. Carnival of Space #108 is here. Carnival of Space #108 is now up at Starts with a Bang! (Man, I have got to update my blogroll) . This special Solstice edition features lots of information about the recent solstice (from a northern hemisphere centric position I may add), remote sensing, geoengineering, Moon watching, Kayuga ... what the heck! Just mosey over and have a read of the of the fantastic compilation there. LCROSS is videoing the Moon live at the moment (feed here). At the moment they are just moving the moon around in the field of view, not terribly exciting. UPDATE: Flyby completed, everything "nominal", video still running. Broadcasting will begin Tuesday 22:20 Australian Eastern Standard Time, 21:50 ACST and 20:20 AWST. For updates see here or SpaceWeather. Sunday morning (21 June), saw the thin crescent Moon below the Pleiades and close to Mercury. Mercury itself was in the Hyades, and formed a second "eye" in Taurus, along with Aldebaran. Above them, Mars and Venus were at their closest. You will have to click on the image to embigeen so that you can see , Mars, the Pleiades and the hyades. Last night was Winter Solstice here in Australia (and everywhere in the southern hemisphere generally). The Bettdeckererschnappender Weisle's choir got together for a special singing session on a rooftop garden in the heart of the city. BEW made a chocolate orange tart to take to the festivities, I took my little telescope. The singing was fantastic. There is something about a rooftop garden that made the songs clearer to me, I could hear every voice. And of course the location helped. It's not everyday you get to look down on a major conurbation while accompanied by wonderful song. I was surprised by the number of stars I could see in the centre of the city. I could clearly make out all the major constellations easily. Scorpio was quite easy to pick out. After the singing I showed some people Saturn (SmallestOne had already had a good look), then we went for supper. While eating supper in the apartment blocks' common room, I discovered a telescope that had been obtained for use in the rooftop garden, with a note saying it didn't work. Intrigued, I set about trying to find out what was wrong. It turned out that the spotter scope was a) out of focus and b) pointing nowhere near where the scope was pointing. After a bit of fiddling I mostly aligned the two, and was able to show the singers the double star Alpha Centauri, the beautiful triple alpha Crucis and the Jewel box cluster (while accompanied by ukulele backed songs). So this morning the lineup was hidden behind cloud. I could see the Moon shining feebly through though. But I stood a moment watching. The clouds thinned and thickened, Venus appeared and disappeared, the whole was accompanied by smaller groups of cloud scudding rapidly across the sky, reddened by the still hidden Sun. The whole thing was very beautiful, and I would have missed it if I had just said "Ugh, clouds"
(yes, Mars makes and appearacne in the image). If you were reading a particularly interesting article, say on how to find the constellation of the Emu , or about the Geminid meteor shower, and you get enthused so you walk outside ... and stand blinking in the dark. You can see a few bright points of light and if you are like me, a glowing square where you were staring at the computer screen, but the sky is a dark wasteland. You have come up against the phenomena of dark adaption. Most people have encountered the phenomenon in the opposite direction, walking in from a brightly lit garden to indoors, for a moment you stand blinking in the dark. Our eyes are amazing things. They can operate over a range of intensity of nine orders of magnitude. But they take time to adapt. In bright light the photopigments (rhodopopsins) are partially bleached, and they must be chemically regenerated . It takes 30 minutes for eyes to become fully dark adapted, which is why amateur astronomers get so annoyed when someone turns on a torch, or heaven forfend, sweeps car headlights across them while they are observing. It will take at least half an hour before their eyes are as sensitive again. If you are thinking, "Half an hour? What's the point of looking? ", don't despair. For the casual observer, you only need six minutes to be able to see stars down to magnitude 5 or 6. This is more than enough to the see sky in its magnificence. If you want to see the faint, pretty clusters, or get the best out of meteor showers, then it's well worth waiting. Even from my suburban location, by waiting patiently I can see the Milky Way aching faintly overhead. And while you are waiting, you can spend your time gazing at the wonderful constellations of bright stars. Within a few minutes you can see enough stars to pick out most constellations. I think this is part of the reason we are disconnected from the sky. Apart from the persuasive light pollution reducing the number of stars we can see, in the suburbs and the city we usually emerge briefly from brightly lit homes to take out the rubbish, feed the cat etc. Not enough time for us to adapt to the darkness even if we do look up. If you have been staring at a computer screen for some time, there is little you can do to speed up the process of dark adaption. Oh, you could turn off all the lights inside and put a sheet of red cellophane over the screen , but that makes watching YouTube difficult and will raise concern from your housemates or partner (or both). The best thing to do is to simply wait. I walk out into the back yard, make sure the backyard lights are off, and I close my eyes for a minute or so. Then I open my eyes and watch the sky unfold around me. Uh, what? There is no constellation of the Emu, you say. I'll tell you about it next week. there are also neural processes involved, but these are quite rapid compared to reversing the bleaching, for a full technical explanation see here. 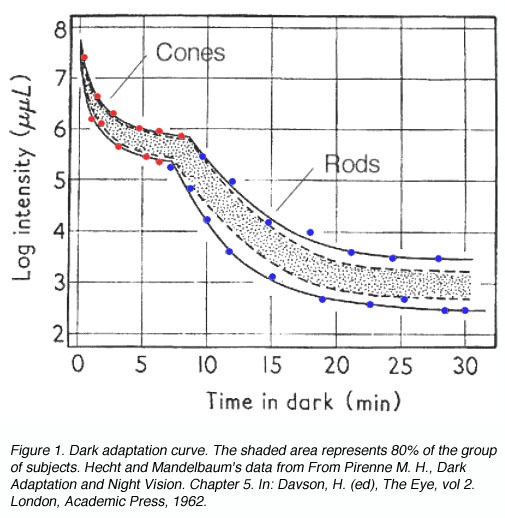 red light doesn't ruin your dark adaption, that's why amateur astronomers put red cellphane over their torches. So they can see stuff without ruining their dark adaption. Venus, Mars, the Crescent Moon and Mercury are putting on quite a show at the moment. And it will be even better tomorrow. I tried to get all artistic with this mornings photos. To the left is the Moon, Venus and Mars framing a Norfolk island pine at the beach (click to embiggen). Below is Mercury, the Pleiades and Aldebaran and the Hyades (again, click to embiggen, you will need to do this to see the image at its best. Yes, I know it is sideways, but that is Bloggers doing, the original image is right way round). From SmallestOne "This is the Portal, it's made a Black Hole. This is the dangerous place, it's sucking everything in. Here is the ocean"
Kaguya Impact: image by Jeremy Bailey and Steve Lee on the IRIS2 instrument of the Anglo Australian Telescope. 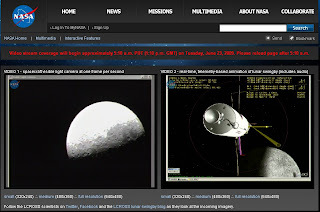 ...The Japanse Space Agencies Kagyua (SELENE) Moon observation satellite crashed into the Moon not far from crater Gill on June 11, 2009. Australian amateurs observed but didn't pick up the impact. It was picked up by the IRIS2 instrument of the Anglo Australian telescope. The success of this instrument might be due to it's higher infrared sensitivity. Over at Lunar Networks there is a discussion of the impact of Kagyua, some more images, and SMART-1's observations of the impact site. Last night the intertubes were jumping in the cometary community, C42 Xingming Observatory , discoverer of comet C/2008 Chen Gao last year, emailed the comets list for observations of a potential new comet. Within a short time confirmations were flooding back, and Good01, now P/2009 L2 (YANG-GAO) (ephemeris here). 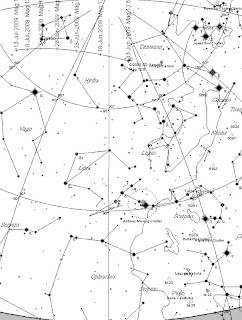 In Scutum, not far from the clusters of Sagittarius, it is currently at magnitude 14.5. A bit too dim for many amateurs, and well out of binocular range. The first confirmatory image from Giovanni Sostero, Paul Camilleri, Enrico Prosperi and Ernesto Guido is here, and a nice follow up image is here. Tont Farkas has a short animation here. Beutiful images taken with the GRAS remote telescopes by Erik Bryssinck and R. Ligustri are here and here respectively. The Lunar Crater Observation and Sensing Satellite (LCROSS) is set to launch on Wednesday 17 June (Universal Time), which means a lunar impact in the range of October 7-11. See the discussion group for continuing updates. North-eastern horizon at 6:00 am local time as seen in Australia on 20 June. As I've mentioned before, all bar one of the bright planets are in the morning sky. Dashed inconvenient for those of us who like our nice warm beds, but if you like getting up on crisp mornings, there is quite a sight for you to see. Jupiter is glowing in the western sky, to the north is the waning Moon and to the east is Venus and Mars close together. Below that Mercury is between the Hyades and the Pleiades clusters. Over the next few days the scene evolves. Mars and Venus draw together, being closest on the morning of the 21st. On the morning of Friday, 19 June, the crescent Moon forms a long triangle with Mars and Venus. 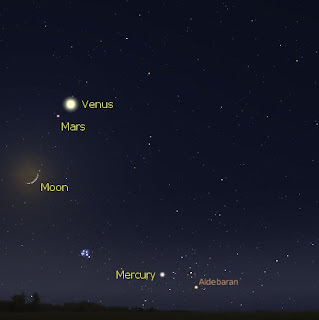 The following morning sees a closer grouping of the Moon Mars and Venus, with Mercury creeping closer to Alderbaran. On the 21st the Moon is close to Mercury, which now is in the Hyades next to Alderbaran, making a second eye for Taurus, the Bull. Pretty nice, well worth the potential frostbite. You can even watch for satellites as well. 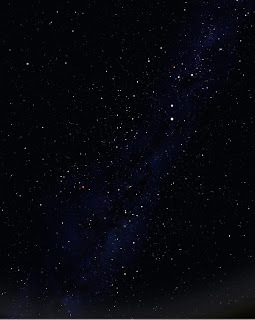 Carnival Of Space #107 is now live at innumerable worlds. There is the search for worlds around Alpha Centauri, extragalactic worlds, previews of the 40th anniversary of the lunar landings, shrinking Betelgeuse, an alternative to space elevators and much, much more. Leave you calculators behind and head on over. What is the Moon REALLY Made Of? Tony Travaglia of Otago, New Zealand has done it again! 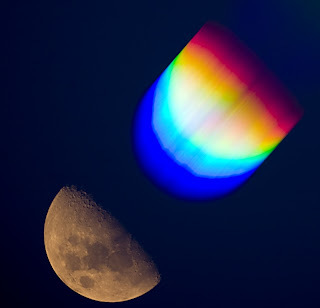 He's taken this fantastic image of the Moon and it's spectrum. I can't wait to see what else he photographs with his new spectrograph. As part of the Australian Society of Medical Research's Medical Research Week, there will be a Science in the Cinema event at the Mercury Cinema, 13 Morphett Street (near the Jam Factory) Adelaide. There will be a Screening of "An Inconvenient Truth", followed by a discussion lead by a panel of experts on climate change and human health and disease. 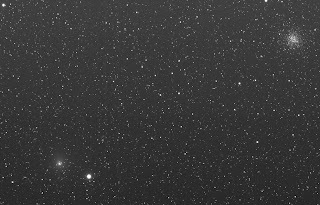 Comet C/2008 Q3 Garrad is in outburst. 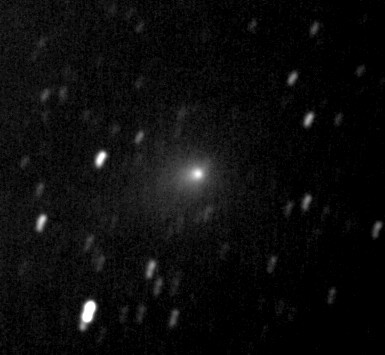 This comet should be very faint, around magnitude 12-13 (and is still listed as such in the MPC ephemeris), but is currently around magnitude 8. Well within the reach of modest telescopes and, if you have good eyesight and are in a dark sky location, 7x50 and 10x50 binoculars. Due to a variety of factors (like cloud and an inconvenient Moon), I haven't been able to see Q3 Garrad in binoculars yet. Which is disappointing, as the comet has been traversing some really beautiful territory. It has been near the stunning globular cluster Omega Centauri, globular cluster NGC 6362 and the galaxy Centaurus A recently. However, I was able to use the Global-Rent-a-Scope system to image C/2008 Q3 Garrad near NGC 6362 and Centaurus A. Sadly, the Rent-a-scope system was clouded out when I wanted to image Omega Centauri. The images you see were taken with the widefield G12 using a 90 second 1x1 binned exposure with luminance filtering. I also took a RBG colour series of the Centaurus A encounter, but I have been unable to assemble the images into something worth while yet (anyone who has experience with Global Rent a Scopes RBG images and Image J, please contact me). The comet is now in a quieter part of the sky, However, it will come within 3 degrees of globular cluster M68 between 21-23 June. If you would like to look for it it, there is a spotters map to the left, click to embiggen and print, and a PDF format binocular map is here. Other images of C/2008 Garrad are here, here, and a stunning colour picture of the comet near Centaurus A by Rob Kau is here and another here. Follow this link to an amazing picture of comet Q3 Garrad near the galaxy Centaurus A. Cloud, cloud and more cloud. Here's a nice picture of the Moon I took earlier. Thus is with the unguided 4" reflector, Philips ToUCam run by Vega and stacked in Registax. Comet 22P Kopf recently passed relatively close to the planets Jupiter and Neptune. 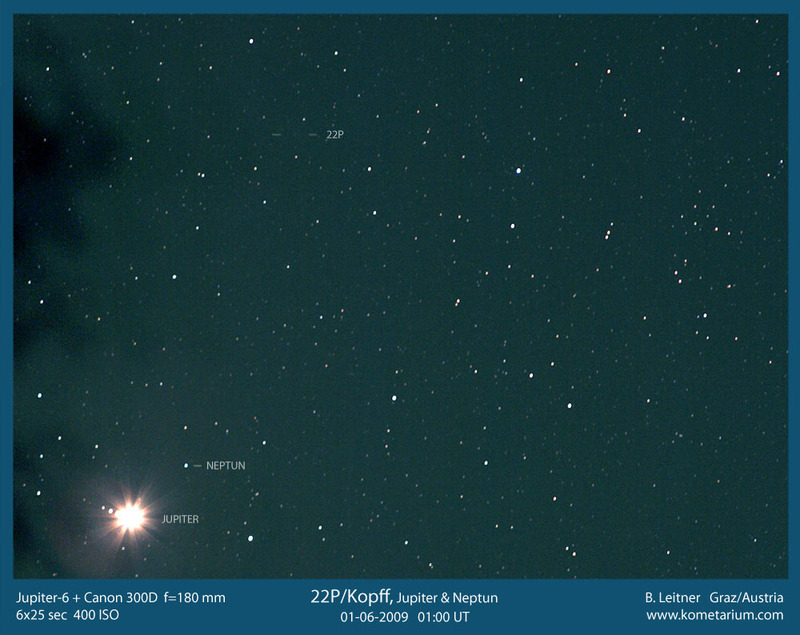 Here is an image from Bernhard Leitner taken on June 1, and here is one from Ernesto Guido and Giovanni Sostero showing Jupiter's Moons as well. 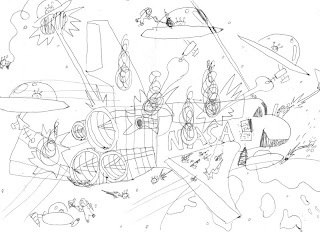 Carnival of Space #106 is here. Carnival of Space #106 is now up at the Next Big Future. There's Interstellar ramjets, rotating space elevators, antimatter propulsion, online lunar maps and lots, lots more. So catch the elevator over there and have a read! EldestOne, MiddleOne and Myself are at Conjecture 2009, the 48th Australian SF convention. My main interest was the workshop by Canadian writer and academic Julie Czerneda, facilitated by Helen Merrick. "The Universe is Made of Stories" was a science educators workshop that looked at how to engage studenst in science using scienc fiction. This was very exciting and engaging, and I learned a lot that I can take back for my own teaching practice (Interestingly, pointing out plot holes in SF movies can disengage people form understanding science) . They boys have been building all sorts of things, including Ornitopters, I've also been to presentations on the Academic as Hero (I liked that one of course :-), Future cites and the author of a book EldestOne has, D M Cornish. Writer and illustrator, he had interesting stories to tell accompanied by his own detailed illustrations. The Boys are now confirmed SF con fans, were' going back today for more SF goodness. The voting is now open for the 3 Quarks Daily Science prize. Contest details are here, you can see the list of contestants (with links to their posts) here, and you can vote here. I'm in the list, and if you would like to vote for me I'd be chuffed. Do read the others though, you will discover some very fine science writing. The June edition of Southern Skywatch is now up. All bar one of the bright planets is in the morning sky, so you have to be a bit of an early riser to see them. But it's well worth it. Oh, and Mars will not be as big as the full Moon in August. It's a hoax. So I went to Science Outside the Square with various non-mature hominids in tow. Despite the Royal Institutes weird email alert system which is guaranteed to send all emails into the spam folder, the Governor Hindmarsh was packed. And you could see why. Fred Watson (the famous telescope guy) and Sean Williams (the Science Fiction Guy) were terrific. Individually they were witty and entertaining, together they sparked off each other, throwing out sparkling ideas into an enthralled audience. 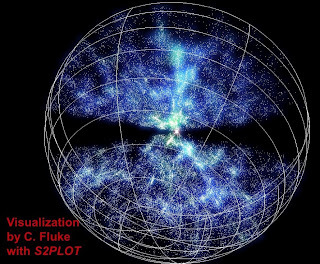 Galaxies featured a lot, Fred showed an animation of the The Six-Degree Field Galaxy Survey (you can read about it here ), a stunning 3D fly-through of the galaxies you can see in just 6 degrees of sky. that's a patch of sky you can cover with your outstretched hand. Sean talked about colliding galaxies and their merging black holes. I got to ask a quaetion (what was their favourite explanation for the Fermi Paradox), and got to chate breifly aftewards (acting like a bubling fan-boy). I thought it might have been a bit "talky-talky" for the non-mature hominids, but they were as fascinated as I. ... this life, with a week of ups and downs. Last night I came back from chairing an exciting session at the Australian Society of Medical Research conference to find that EldestOne didn't get into the the high school he dearly wanted to get into, after doing the entrance exams and interviews we had really thought he would get in. Ah well, there are other high schools. Advances in science and technology speed along at such a rate it can be hard to know exactly what's out there, and to separate the plausible, possible or predictive, from the cold hard facts. While much of the fiction, remains just that (at least for now! ), other ideas have been strangely prophetic. In fact, some of the science facts we take for granted started life as imaginative musings in novels and pulp fiction mags. You may have heard that cyberpunk writer William Gibson ‘predicted’ the advent of cyberspace (albeit in a somewhat Matrix-like sense that’s yet to be realised), but did you know that Kepler first suggested the concept of weightlessness in his 1634 Somnium (dream)? Or that HG Wells wrote, as early as 1914, of the devastating power of an atomic bomb, and predicted the splitting of the atom to within five years? How about the ion engines that power StarWars’ starships… Fact or Fiction? Closer to fact than you might think. Join best-selling sci-fi author Sean Williams and astronomer and popular-science writer Fred Watson as they explore how science and science fiction borrow from each other to entertain and to expand knowledge of the universe. 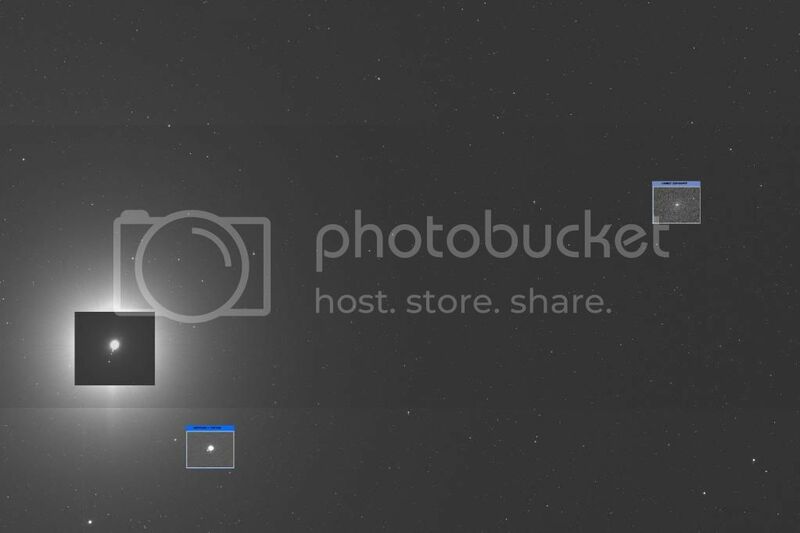 Plus share with us their love of astronomy, cosmology and writing. Clare Peddie, The Advertiser’s science writer will facilitate, and the evening will include a musical interlude with Fred Watson on guitar. 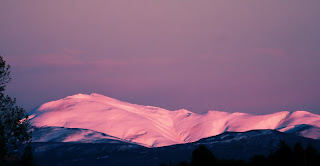 A fantastic image of snow-covered mountains fro correspondent Tony Travaglia of Otago, New Zealand, who has provided many magnificent images. Click to embiggen. Join us this Tuesday for the twelfth and last instalment of the Climate Futures Seminar Series entitled ‘Climate Futures’ convened by Dr Steven Cork. The overwhelming focus of public discourse about climate change over the past few years has been on predictions of where and how much climate might change globally and nationally. Now that consensus is being reached that climate change is happening, attention is turning to what it might mean in terms of the lifestyles and well being of humans and other species. If there has been uncertainty about how bio-physical processes might change in the future, there is much more uncertainty about how climate change might interact with other economic, social and ecological changes and how humans might respond to these interacting changes. Scenario planning is one tool that has been used to explore the range of plausible futures and their implications. This seminar will take attendees through the steps of a typical scenario planning process, looking at the drivers of change that could combine with climate change to produce major challenges and opportunities, then synthesise a number of scenario planning projects from around the world and Australia, and consider the implications for preparing Australia for plausible futures. Prominent among most scenarios about the implications of climate change are considerations of how changes in energy resources and policies might interact with carbon policies and how both might interact with changes in governance models nationally and globally. ‘Climate Futures’ will be presented on Tuesday 20 May at 6-8pm in the Horace Lamb Lecture Theatre, University of Adelaide North Terrace campus. Registration for this event is preferred. The Moon, Venus and Mars for a nice lne in the early morning of Friday Mat 22. 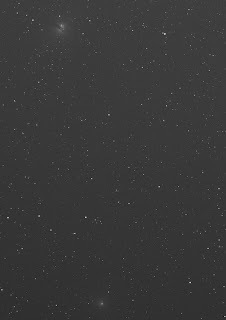 You will need to click to embiggen the picture to see Mars.